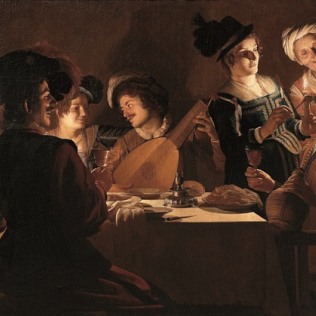 Gerrit van Honthorst, famous in Italy as Gherardo delle Notti (Gerard of the Night), is the protagonist of the first big exhibition at the Uffizi Gallery in 2015. It’s an important occasion to admire the paintings by this exponent of the Utrecht Caravaggism. His nickname is due to his virtuosity in representing scenes well-lighted by candles, and characterized by a strong contrast between light and dark. He was born in the Netherlands, but in the first part of the 17th century, he stayed in Italy for about ten years: he lived and worked in Rome, as others Dutch artists at that time. In Rome he got in touch with the art of Michelangelo Merisi da Caravaggio, that influenced him very powerfully. The Italian period is considered the richest for his art. His painting had soon a big success, and they were exhibited in several churches in Rome and in other important Italian towns. When he came back to the Netherland, Gerrit worked as an exponent of the Utrecht Caravaggism. That was an artistic tendency characterized by the strong use of the chiaroscuro, the realism of the representations and the angle chosen for the paintings. Gerrit had a large success in the Netherlands, and he concentrated his work on genre scenes, often represented with the light of a single candle. During his Italian period, the Grand Duke of Tuscany Cosimo II became one of his patrons. For this reason, the Uffizi Gallery owns four paintings by van Honthorst. One of them – the Adoration of the Shepherds – became the symbol of art injured by the bomb explosion in via dei Georgofili: it was very damaged, but it is still exhibited, to represent the reaction to the attack, and to a difficult period for Italy. The first single-subject exhibition dedicated to Gherardo delle Notti will be open until May 8th. In the exhibition there are the paintings of the Uffizi, some others arrived from Rome, Genoa, Amsterdam, London, Oxford, Berlin, Munich, Saint Petersburg, Cleveland, Los Angeles and Minneapolis. There are also paintings by other artists, to show how Gerrit was part of artistic milieu of his time, and how his art influenced artificially lit scenes painting. The Cavadenti by Caravaggio – from the Palatina Gallery – is also exhibited: this is a very important painting for van Honthorst, so much so that somebody suppose a period in Florence. The exhibition is promoted by the Ministero dei beni e delle attività culturali e del turismo with the Direzione Regionale per i Beni Culturali e Paesaggistici della Toscana, the Soprintendenza Speciale per il Patrimonio Storico, Artistico ed Etnoantropologico e per il Polo Museale della città di Firenze, the Uffizi Gallery, Firenze Musei and the Ente Cassa di Risparmio di Firenze. It is organized by Gianni Papi, that is responsible also for the catalogue, published by Giunti.